I began my journey with yoga as a teen, at a time when I felt a disconnect between my body and mind. 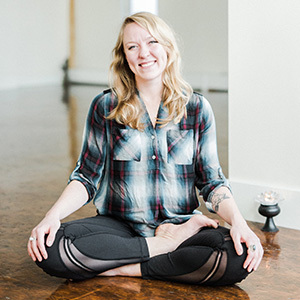 As my practice evolved over the years, this connection renewed and strengthened, ultimately leading to my decision to take my first yoga teacher training (YTT) in Akhanda Yoga. I was immediately drawn to the blissful and holistic approach to the practice, opening my eyes to the possibilities of a world beyond the physical. After falling in love with teaching yoga part-time, I left a corporate engineering career to more fully immerse myself into yoga. I traveled to India to study with my guru Vishva-ji and completed my 300 hr YTT in Akhanda Yoga. There I received the gift of my spiritual name “Yog Jyoti” – meaning “holding the light of unity.” In honour of this blessing and in devotion to those around me, my goal is to create and hold space where others can explore and recognize their beauty and brilliance within.